Are you familiar with Shaker cards? If you're not a paper crafter, you might not have seen these yet, but they are sssoooo cool and fun. Shaker cards have been around for quite some time and can be created using a variety of materials. They're basically a 3D card that has a clear window where you place little rhinestones, confetti or charms that shake...hence the name. 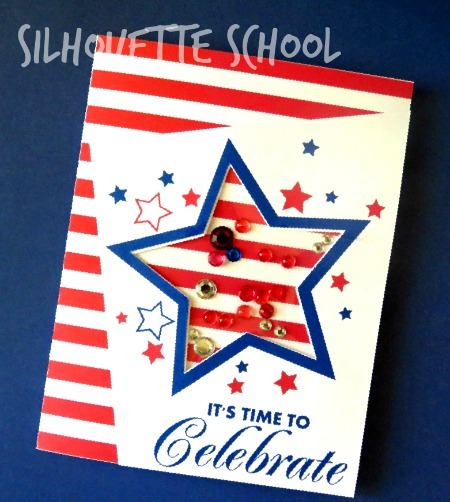 Today Silhouette School contributors, Glenna and Becky from My Paper Craze, are in the classroom sharing an easy shaker card tutorial with us. They're going to show us just how easy it is to make one with your Silhouette and items you probably already have in your crafting stash. 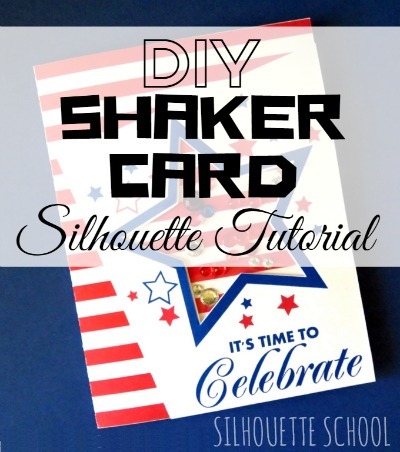 No need to run to the store to make a last minute shaker card! I started off creating a print and cut design in Silhouette Studio. 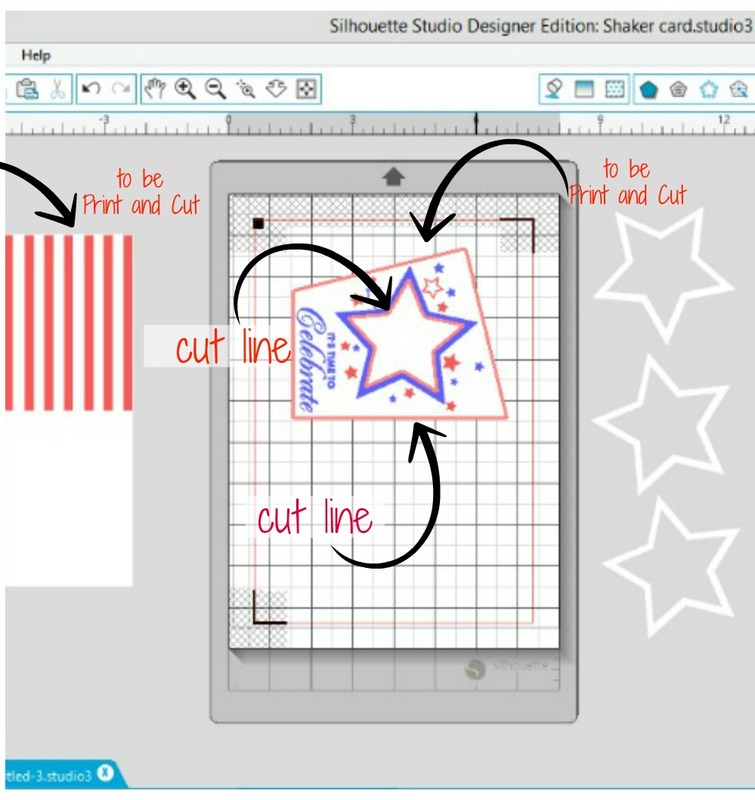 I'm not going to go over all the print and cut steps since Melissa has already covered that with you in her fabulous beginner post: Silhouette Print and Cut Tutorial for Beginners. I intentionally chose to have two layers to create the depth I need to get the shaker effect. I also went ahead and duplicated the large center blue star shape 3 times as you can see in the first photo below so that I could cut everything at one time. You'll see what the extra stars are for in just a minute. The card base (red and white striped/white piece) is a rectangle with a dashed line down the middle to create the fold line. 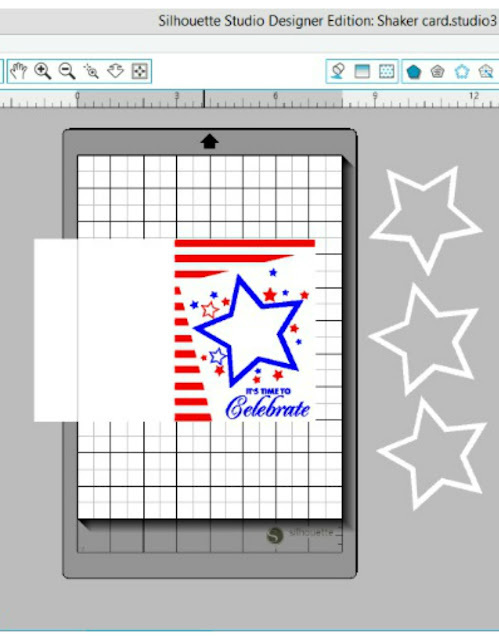 The basic size of a handmade card is 4.25" x 5.5" (A2), so you'll need to size your rectangle to 8.5" x 5.5" with your dashed cut line at 4.25". You can make it any size as long as you stay within the cut area of your mat and don't forget about needing to fit inside an envelope. In the photo on the right above I opened the cut window to show you that I'm only cutting the outline of the top layer and the inner edge of the center blue star. OTHER ITEMS you'll need include a glue pen (we prefer Zig 2-Way Glue Pens), two clear acetate sheets and some goodies to put in your shaker, such as rhinestones or sequins or confetti. Once I had the card layers and extra stars cut all I needed was a piece of acetate and glue. If you don't have any acetate sheets (I don't) you can use any clear plastic from packaging or a transparency sheet would also work fine. I used a clear plastic card sleeve. The only exception might be if you're putting something edible in your shaker and in that case you might want to check into food safe acetate sheets. 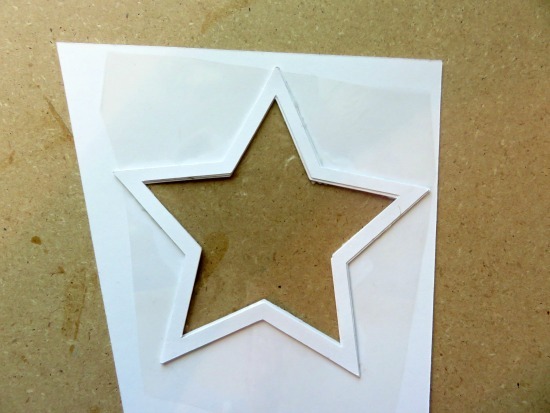 Trim you acetate sheet so that it's larger than the star opening but not so big that it will stick out from under your top card layer. Once your acetate sheet is trimmed, place the top layer of the card face down. 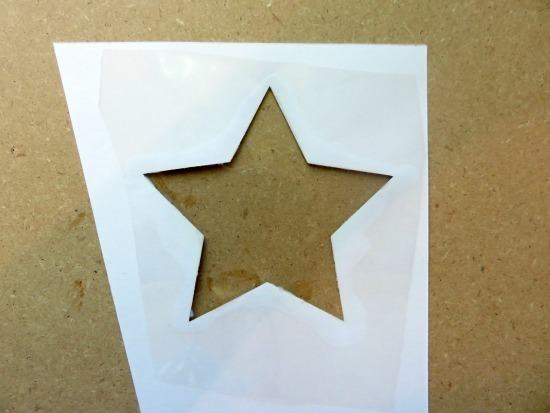 Use the glue pen to apply apply glue close to the edge of the star cut out and set down the plastic sheet on top (be sure to cover the entire star so you get a tight seal). Now comes those extra stars we cut out. 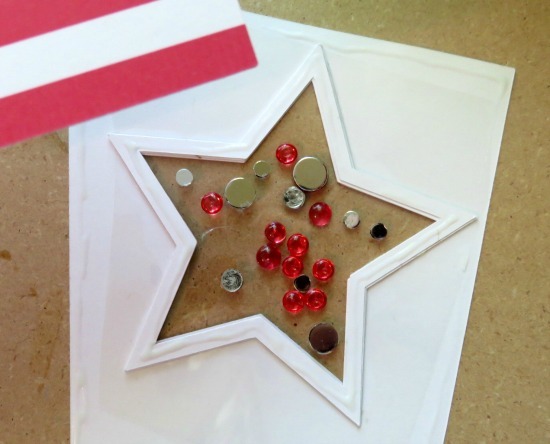 You're going to glue each one on top of the other to create one thick star. You need the thickness to create the space between the card base and the acetate sheet to add whatever items you choose to put in it. Be sure to glue all the way around to get a good seal. 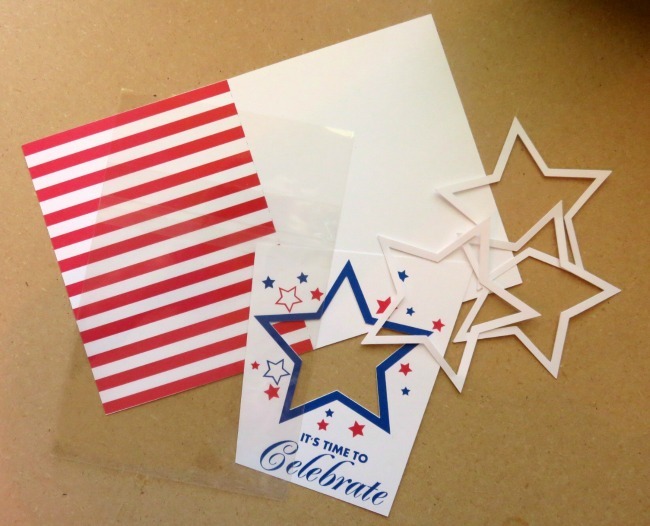 Grab your card front with the acetate sheet, add more glue around the star shape with your glue pen and glue it all together. Now you're ready to fill in your star shape. You can use as many as you want and you can use anything from sequins and rhinestones to cupcake sprinkles. You could even cut small shapes out of different colors of cardstock with your Silhouette. Just make sure your items aren't any thicker than the space or they won't shake. The last step is to place glue all along the star opening and the edge of the top layer of the card and place your card base face down on top of it to complete your shaker card. After all the parts are glued together, give it a good amount of time to dry. Once you start shaking this baby, you sure don't want it falling apart!